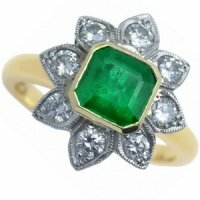 Octagonal Emerald and Diamond Floral Cluster Ring. A happy, sparkling emerald and diamond, flower shaped cluster ring. This eye catching ring, is composed of an octagon shape emerald, weighing 1.22 carats, and eight brilliant cut diamonds, set in 18 carat white gold as petals, weighing 0.59 carats in total, to an 18 carat, yellow gold shank. 18k - 750.